With this recipe for gluten-free pumpkin pancakes, you can make a light, spiced crepe in a number of ways -- plain, prepared with chopped apples, or mixed with chopped pecans. If you want your pancakes both gluten- and dairy-free, substitute coconut milk or your favorite non-dairy replacement for real milk. This dish makes for a delicious breakfast meal or a snack later in the day if you're craving something that's both sweet and filling. Combine milk, pumpkin, eggs, oil, vinegar and vanilla in a medium mixing bowl and beat until smooth and creamy. In a separate medium mixing bowl, combine gluten-free flour, sugar, baking powder, baking soda, spices, salt and xanthan or guar gum. Whisk until thoroughly combined. Add dry ingredients to wet ingredients and stir just until combined. Pour about 1/2 teaspoon of cooking oil in a heavy skillet and heat over medium high heat. Pour 1/4 cup of pancake batter into preheated skillet and smooth into a circle with a spoon. Cook each side of pancake until golden, about two to three minutes per side. Add about 1/4 to 1/2 teaspoon of oil to preheated skillet before pouring batter into skillet for each pancake. Serve warm. Add just one more ingredient to this pumpkin pancake recipe and you have some delicious new flavors. Try sprinkling about 1 tablespoon of finely diced apple (keep the peel!) 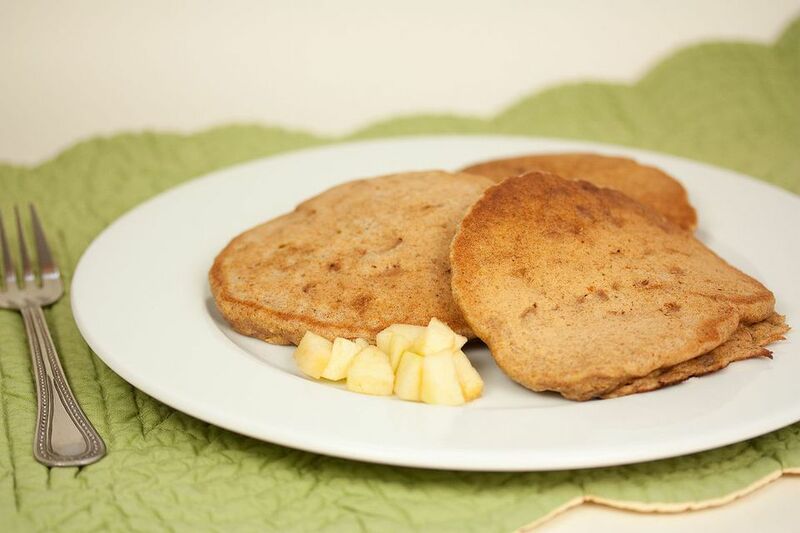 onto one side of your pumpkin pancakes for delicious gluten-free apple pumpkin pancakes. If you're a nut lover, try adding about 1 tablespoon of chopped pecans for delicious gluten-free pecan pumpkin pancakes. It's as easy as preparing the pumpkin pancake mix, pouring it onto your skillet and adding your ingredient of choice. Then cook as usual! Always make sure your work surfaces, utensils, pans and tools are free of gluten. Always read product labels. Manufacturers can change product formulations without notice. When in doubt, do not buy or use a product before contacting the manufacturer for verification that the product contains no gluten.